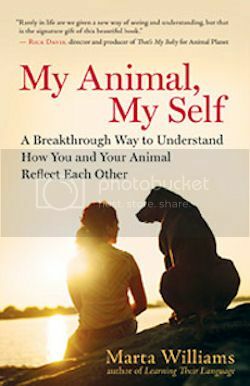 My Animal, My Self by Marta Williams is a wonderful book that animal lovers will greatly enjoy. The author is an animal communicator that helps us to see how our relationships with our animals often reflect ourselves. My Animal, My Self is a book for true animal lovers. As an animal lover myself, I really enjoyed this book and learned quite a lot about my animals, and myself. Learning how animals can mirror us and how they can teach us many lessons in life, is a joyful and insightful read. Some companion animals can mirror us in negative ways though, and this is of course not a good thing for us or them. The author gives examples of how to change this situation for both the human and the animal, which will hopefully help many humans and animals alike out there. I found this book to be really interesting and would love to see this researched in more depth. The topic is truly worth looking into, and if you are an animal lover, this is definitely a book that you want to read! I highly recommend it. * Thank you to the publisher of My Animal, My Self, New World Library, for providing me with a copy of this book for review. All opinions expressed are my own.